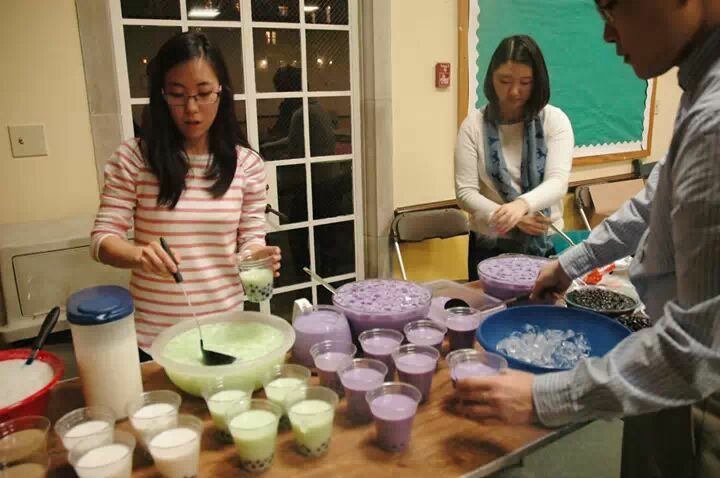 On March 6, Asian Sensation hosted BubbleTea and Origami Night in the BC from 8 – 9 p.m. Bubble tea is a drink that originated in Taiwan and has since been consumed all over Asia. Before the event, the members of Asian Sensation were busily making bubble tea. They first boiled tapioca pearls, large chewy balls that go at the bottom of the bubble tea. The bubble tea drink was made by mixing powdered milk tea. After that, the bubble tea was refrigerated and served. At the event, there were four types of bubble tea: honey dew, coconut, taro, and the original flavor, milk bubble tea. Because the Asian Sensation members made so much, many people got to try more than one type of bubble tea. After sampling all four flavors, it was evident that each was distinct and could not be compared to each other. There was also a table set up with a variety of origami papers. When asked what exactly origami was, Asian Sensation member Alexis Vannier (C’ 17) simply stated that “it is the art of folding paper.” While watching her, it really was an art. While she made a dragon, it took a lot of focus and precision so that the paper would come out looking like a dragon. Some of the popular origami peices were cranes, boxes, balloons, hearts, and jumping hearts. Basically, anything could be made with focus and creativity. From the many people that attended Bubble Tea and Origami Night, some knew what bubble tea and origami were. However, there was also a good chunk of people who did not know this but still came. Education is one of the purposes of Asian Sensation: to promote Asian culture and to provide an outlet to practice Asian culture. Next time, join the Asian Sensation at the K-POP Dance Party on March 29 at the MCC to learn about popular music in Korea.